When any group of people determine what constitutes “fake news”, or “hate speech” or something “grossly offensive”, they have clearly proclaimed themselves as the moral arbiters and the all-knowing Gods of the world. Hence, we end up with their relentless demands to be all-seeing as well. Feeling entitled to access any private information to sniff out wrong-think because they are supposedly model human beings, they are reprehensibly snooping in the private lives of citizens. Explicit invasion of privacy and thought policing — not exactly good examples of moral behaviour. In the UK, this trajectory has led to the landmark case of Count Dankula (Mike Meechan): a comedian that taught his girlfriend’s pug to do a Nazi salute as a joke to annoy his girlfriend. The penalty for a joke that some people of an unintended audience didn’t find funny? Jail time. 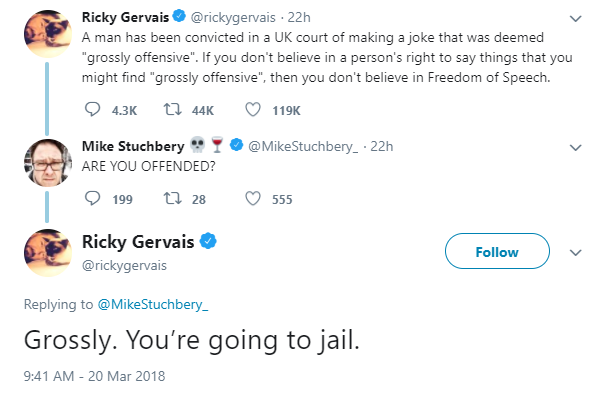 When it is an indictable offense to be offensive, joke telling is now illegal. Someone, somewhere is not going to find any joke funny. Someone, somewhere will find any joke “grossly offensive”. But the obvious double standard being ignored is that many are finding it “grossly offensive” that these lawmakers and vigilantes invaded the privacy of a comedian to sniff out wrong-think. Many find it “grossly offensive” that people now have to repress their thoughts, satirical or not, regardless of context, for fear of being caught not thinking like the collective Borg and facing jail time. Many find it “grossly offensive” that in all verbal disagreements, someone is inevitably offended, and given the current state of law in the UK depending on which side the judge and jury take, one-half of every disagreeing couple is considered a criminal. Of course the lawmakers and their enforcers aren’t going to jail for all their instances of being “grossly offensive”. When the moral arbiters think they’re always in the right and never in the wrong, logic has no place in the resolution of any particular disagreement with them. While logic will rightly defend the right to free speech, to offend or be offended, the moral arbiters’ opinion defeats logic in their world. And in this living paradox, it is those that disagree with the moral arbiters that face jail time and never the moral arbiters themselves. In their minds, you have no right to be offended by their decisions. These drafters of “hate speech” laws and “fake news” regulations based on their subjective views of “hate” and “fake” are writers of gospel and disagreement with them is tantamount to blasphemy. Unless you are one of those totalitarians, it doesn’t matter whether you agree with them now on the moral issue of the day, because you will inevitably disagree with them on something. You will inevitably be jailed (or just shot in the head for expediency when the prisons or gulags are full) with everyone else that tried to defend your right to think freely, speak freely and voice a contrary opinion. If you enjoyed this article, be sure to share, leave a comment or subscribe to the RSS feed.